The domaine was created in the 1920’s by Stephane’s grandfather, André, who was then followed by Edmond. Nine hectares are farmed which is all owned or en-fermage from family members. Of their nine hectares, fully 6.5 are in the 1er Crus of Maranges, six 1ers in-all, and one of them you can only buy from this domaine. This is a domaine whose following is mainly in France, only about 15% of the production are exported. The domaine is run under ‘lutte raisonnée’, Stephane noting ‘but I will only intervene if I really have to. The vineyards are ploughed and we grow weeds between the vines to stop erosion.‘ Stephane built a nice new cuvérie in 2009 which, because it’s built on a hill (like the rest of Dezizes) allows him to move wine around by gravity rather than pumps. Actually, you don’t expect to see such a nice big new cuverie in Dezizes as there seems no space for new things! 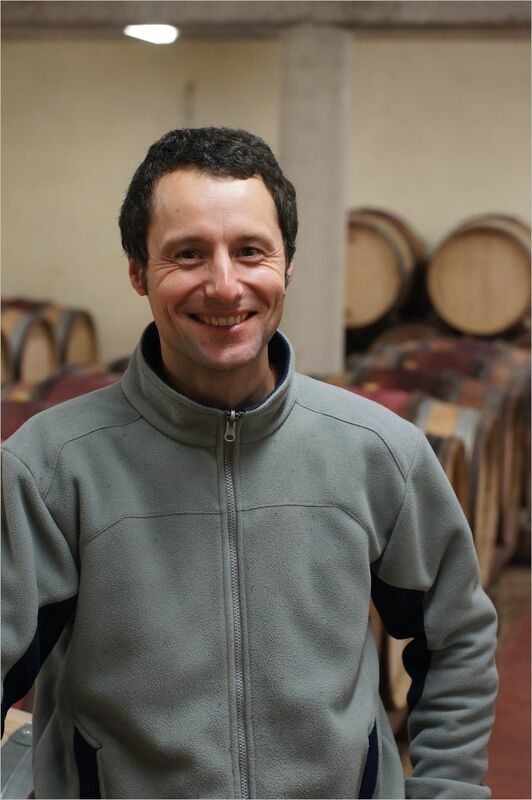 Stephane is very happy how the wines have developed since this investment – ‘I really find the wines more supple now‘ he says. The fruit is hand-harvested, triaged and then destemmed at the domaine before a cuvaison of approximately 21 days in large cement tanks. Stephane likes to make plenty of pigeage at the start but prefers to finish only with pumping-over. The wines spend about 12 months in barrel and then another 6 in tank before bottling. Some of the cuvées see no new oak at all, others might receive 30% new barrels, but generally the use of new oak is very modest. Tasted with Stephane Monnot in Dezizes, 14th Dec. Overall I found these to be quite nice wines – occasionally there’s one I might have second thoughts about, but all the reds had a wonderful fruit perfume – just gorgeous. I even bought some! From the bottom of the villages on more granitic soil. No wood in the elevages. A savoury nose with a hint of must that needs to lift. The flavours have a full, clean and balanced impression – a good mouth-full of wine here, lots of flavour, finishing a little savoury. From a parcel of east-facing vines near the village of Sampigny. Elevage in barrel – none new. Deep, ripe fruit notes. I like the texture, and the fruit is nicely off-ripe but with a good density of rich flavour. This is both powerful and balanced. From vines set next to the Clos Rousseau. 15% new oak used in elevages. The aromas are very round, and perhaps a little dense. There is more flavour dimension and more energy. More density and length too – indeed, more of everything. Good wine. From the vines nearest Dezizes. The nose is easily the nicest of these whites – quite fresh with a depth of something like greengage. More mineral, good intensity. The flavour grows and grows, even after swallowing – good extract in the finishing flavours. Very good. From vines close to the village – here the soil is poor and the weeds compete for nutrients with the vines. Elevage is only in older (6-7 year-old) barrels. Beautiful red fruit nose – yum! Bright personality with decent intensity. Clean lines, lovely energy with an extra dimension of flavour. The tannin is understated, but present. Elevages in 1-4 year-old barrels. Again, a lovely red fruit note – very precocious. The acidity is more pronounced but the flavours also more mineral and intense. Perhaps just a little too acidic. Only three barrels of this, one new. Yield in 2012 was slightly down (28hl/ha – was 30 in 2011) but not due to hail, rather the coulure brought about by heavy rain during flowering. Stephane notes that the soil has more clay here which makes the wine consitently more closed in its youth. Lovely red fruit – a melange of deep, slightly roasted fruit at the bottom and red berries on top – quite lovely. Round, with good underlying acidity and plenty of sinew and muscle – as opposed to fat. Concentrated with a slowly growing intensity before a mineral tasting finish. Good and and still showing very young. Glad to find info on the domaine here. Love the profile and notes. On the Maranges, I believe that’s Clos de la Boutiere not Boudriote? It’s a sort of co-monopole since 2005 when Bachelet-Monnot took about half of it. Still vague on how this happened. The Bachelets have an uncle Monnot whom I presume was the source of inheritance, but don’t know for sure how it occurred. If you have the story, I’m curious to know. Have you had any of the wines from Nicolas Perrault?